Please find an article about MacGyver. I made my best to translate, and apologize if they have some mistakes. That day when ....MacGyver arrived in France. It is around 2.30pm when the spectators of the canal 2 leave temporarily their loved animator and the emission "Everybody knows it" to better find it less than one hour later for the show "the fans school". In the transition phase, they are offered a new fiction from across the Atlantic. The first scene unfolds "Somewhere in Central Asia, today", in the middle of a vertiginous landscape, supposedly hostile to the Man. At the pinnacle of a vertical cliff, a guy tries his hand at a suicidal climbing company while narrating his prowess. Wearing a cap with red pompom, the blond hair browser does not yet show its incomparable mullet cut. Moments later, he delivers a prisoner locked in a wooden cage while performing his first sleight of hand. It will take eight minutes and thirty seconds to discover this generative lively, playful and tactfully labeled "80s". The women are immediately conquered by the virility of Richard Dean Anderson. In one episode, he sports a particular black Tshirt, value sweat and wish his muscular finesse. The 6 feet 2 inches tall handyman, able to make a bomb with fertilizer, tree bark and acid; to immobilize a Russian officer by pulling on a rope fixed to a beam; to open a condemned door by removing the nails hinges ... will then be tossed chain chain (Antenne 2, La Cinq, France 3) to finally land on TF1 will propose the last unpublished in 1995 before stringing rebroads into the 2000s. In January 2018, M6 acquired the rights of the MacGyver reboot, this time played by Lucas Till. For the time, three seasons have been produced, for a total of sixty-four missions. The private channel, struggles to gather with a market share of less than 10% since the second season and a switchover on Saturday night. The "Mac" 2.0, at the forefront of technology, however does not reach the peaks of popularity of its predecessor. Last edited by karinedauphin on Sun Apr 07, 2019 3:19 pm, edited 1 time in total. 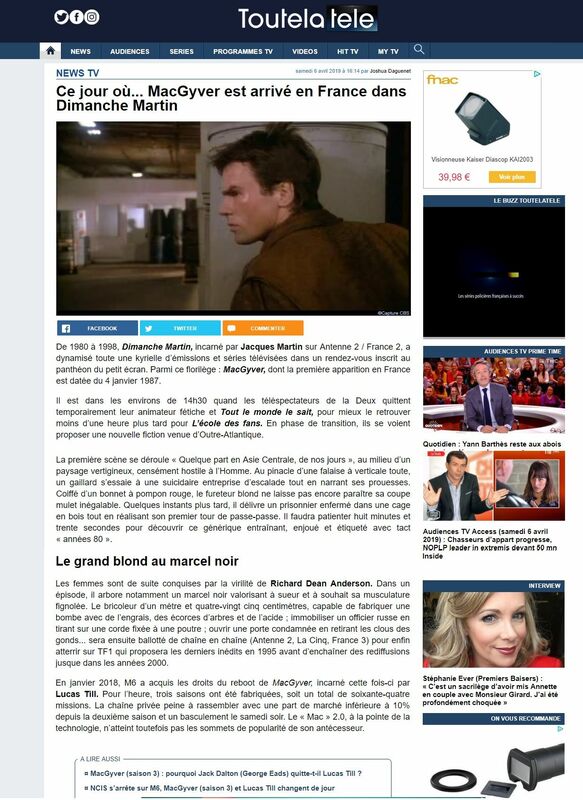 Re: MacGyver in the frenc "Press"
So ... I will say.... Stop reboot... no ?